$100 to $200 an hour. Rob Schneider. WAS A BLAST DRAWING HIM! the famouse Drew Lynch! He loved this! My name is Andreea Baker. Thanks for checking me and Timothy out for your event needs! I absolutely love this form of Art. I've have been doing it for many years for events in Oregon, and Washington! It has been my pleasure to entertain people in such a way that brings a big smile to their faces,. We have worked at many companies like, Microsoft, Expedia, Nintendo, Intell, Bellview City Plaza, all kinds of hotels, the Portland Zoo, All-State, Hotels and much more! 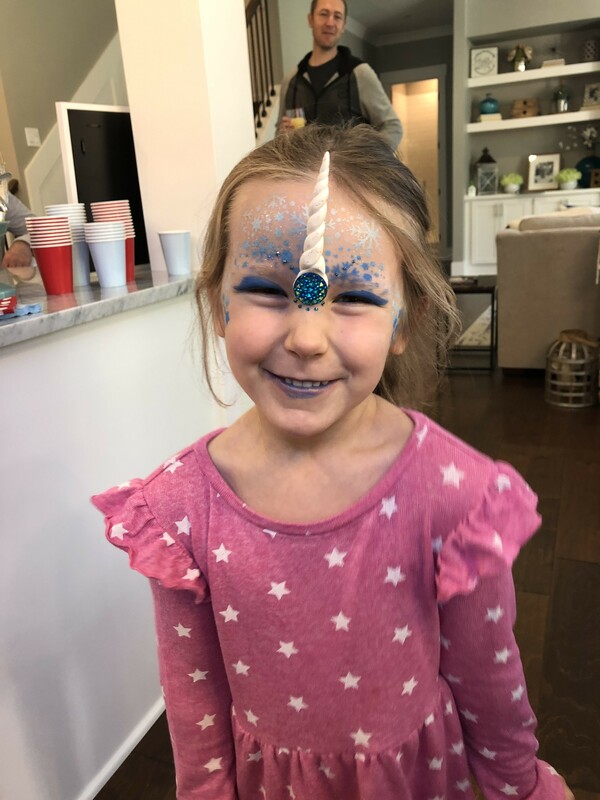 We offer face painting with bling, Henna, water proof glitter tattoos, real matte ink, metallic jewelry tattoos, and caricatures! Your sure to enjoy our personalities and professionalism. Making you smile makes us smile! Andreea was amazing! 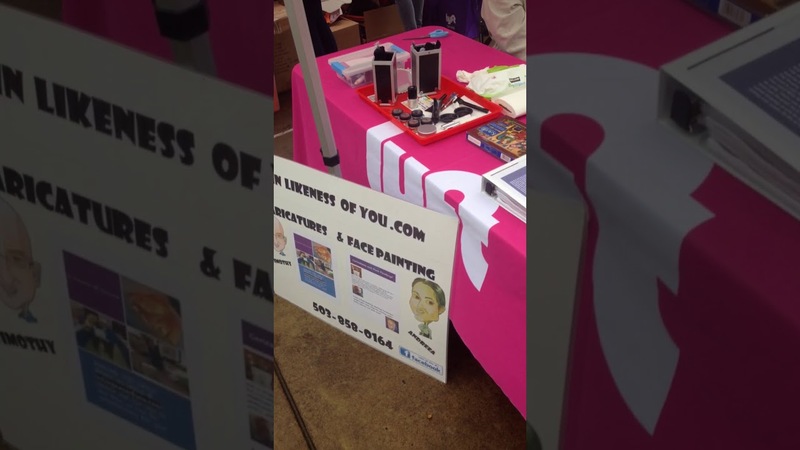 The kids loved their face painting and glitter tattoos! 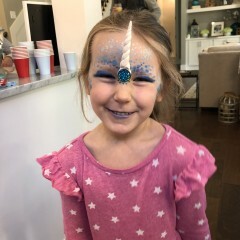 Every parent at the party mentioned how unique Andreea was and how she was so much better than your “typical” face painter! Thank you so much for the wonderful and cool review! My wife loved using her gift of art for your sons birthday party! Making you smile makes us smile! It was a lovely experience. Timothy was so adaptable to our needs - he did a wonderful job capturing our sales teams' likeness and personal traits just as I requested. This was such a great alternative to a typical head shot. Thank you so much for the wonderful review I really appreciate that! Making you smile makes us smile! Talented face painter, accomodating with the youngters! Went extremely well. Kids had lots of fun. The line of little faces kept coming. Thank you so much Denise for this wonderful 5 star review for inlikenessofyou! My wife loved working at your event and is looking forward to working more with you in the future! Making you smile makes us smile! Tim did a couple caricatures for my family and he is absolutely great! I especially like how his caricature have a realistic feel to them and they bring out positive traits in people. I commissioned inlikenesofyou.com (Tim Baker) to draw my niece's family who were all visiting from Germany, a rarity. Also my nephew's family who live locally, this was to be a Christmas present for their families from their uncle. Time was of the essence and Tim drew two wonderful caricatures in perfect likeness in time for Christmas from the photo I took with my phone. Everybody loved it and will be framing them in their homes. Thanks Tim and GREAT Job in record time! I met him at a wedding where he was doing caricatures for the wedding couple and hired him after seeing how he interacted with the guests for an event I was holding. He blends in well yet creates his own space at an event. He has been easy to work with and I have run into him several times now at weddings and birthday parties. I have met his family personally and really enjoy keeping up on his Facebook page. He has great artistic gifts which he uses in a variety of ways and is able to comprehend and adapt so that a customer's piece of art turns out the waythey want them to. Timothy is personable and artistic. Great skills, and he is the frosting on the cake of a great event! Thanks you so much Eric! I am going to bless you for such a great review! Price Range: $100 to $200 an hour. We provide abosolute professional artistic services! The customer would see that we are on time, organized, fully equipped and ready to Go! They would also catch on very quick that we have great personalities and work very well each other. If they want a caricature done, it will be on the spot as I have fun drawing them and conversing with them in a entertaining way! If they want to mingle instead of staying in the hot seat, I can also draw them right from a pic taken with my iPad. 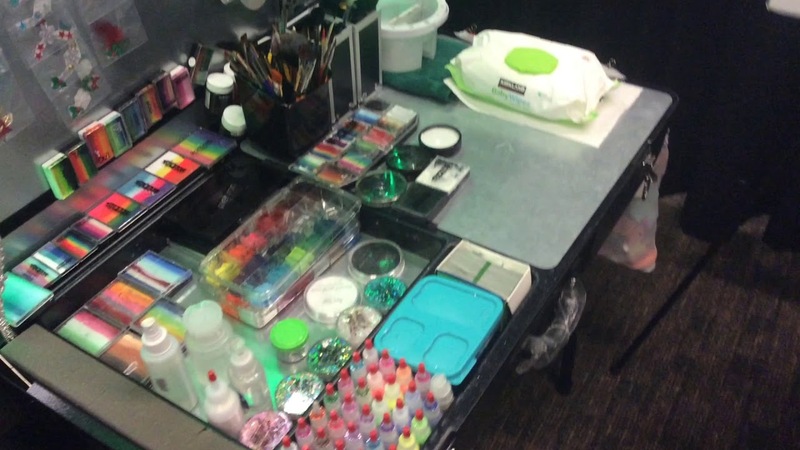 If they request my wife to do face painting, glitter tattoos, or Henna, they would see all the supplies needed, clean and organized in her brand new craft and go face painting kit! She is fully insured and all her products are safe to use. They would have a chair to sit in as she workes wonders on thier face, hands, feet or arms. She does half face and full face painting. 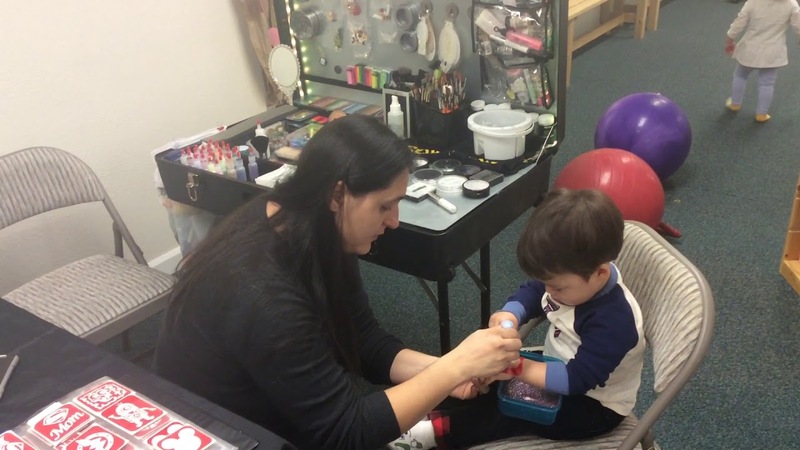 Our customers are sure to be more than happy with hundreds of samples of glitter tattoos to choose from which only take a couple minutes to apply and they last for about a week on the skin. These are a fun and fast way to entertain many guest at all kinds of events. Finally, in the request for Henna, they would see the real matte temporary tattoos selection that she has invested in and would be sure to have a great memory from the art she can creat on them! After the show is all, done, we take care of any clean up that we need to do and than after dealing with any final business matters, we thank them for hiring us adn make sure that they we did everything they wanted. A review request is asked for our services and than it is off to another event to bring more smiles to more people! My name is Andreea Baker. I am a Face Painter/ henna / real matte ink/ glitter tattoos Artist in Portland Oregon. I have been doing this art for many events all over Oregon and Washington. My love for this art is inspired by seeing the grand smiles of customers after they have received a special Artistic creation by me. The truly creative service I offer is face painting with hand made bling prepared for each event matching the themes. Temporary water proof glitter tattoos from a huge selection to choose from! Henna designs and the newest, real matte ink! Real Matte Ink temporary, water resistant tattoos are the NEWEST favorite and highly requested among teens and adults. We’ve been offering them and most people and teens would choose a real matte ink tattoo over henna because it dries fast and it looks just like a permanent real tattoo, but minus the permanent side of it. We use them with high definition patented stencils, the Real-Matte Tattoo Ink creates a real-looking tattoo without pain and permanence. Waterproof and lasting up to 3-5 days, Real-Matte is a great alternative to henna and dries in HALF the time! All of the new High-Definition stencils in this kit allow us to cater to teens and adults who have always wanted to take a walk on the wild side! The amount of “realness” and detail that we are able to create will have them coming back for seconds (and thirds!). Hypoallergenic and Dermatologist tested. Another amazing thing about Real Matte tattoos is that they are very easy to apply on the skin. It takes depending on the size of the design, anywhere from seconds to just a few minutes to apply and dry! At big parties almost all of those who are in line for one, get them and we are able to entertain as many as possible! I also offer black and white caricatures drawn by my husband who has been drawing at events many years now all over OREGON and Washington as well. My husband, Timothy and I, make a great team together with 5 stars across the board! Recently we received artist of the year for 2016! AND 2017! "Making you smile, makes Us smile!" Our venues we have worked include Microsoft, yahoo, Intell, Nentendo, Expedia, Franz Bread, OSU, The Portland Zoo, Trident Fish, The Portland Convention Center, The Seattle Convention Center, The Salam Convention Center, Uber, Lyft, Kells Irish Pub, The Sentinel Hotel, the Smith Tower in Sealte, the Olympic Fair Hotel in Seattle, Belview City Plaza Center, Aflac, All State, Team Casinos, the Party Team, Mount Hood Ski Bowl, Tualatin High School, Tualatin Elementary school, Baskin Robins, The down town Spirit, all kinds of graduations and much more! We’v done all kinds of events, everything from: fundraisers, weddings, corporate events, picnic church outreach, birthdays, and all other kind of other venues. If you don't have a budget to cover the cost of traveling, Timothy can offer single themed caricatures that will be sent to you via email. This are hand drawn caricatures taken from the photos the customers provide. Depending on the type, detail of the caricature requested, and theme, prices are negotiable. You bring the people, we will help create the smiles! Thank you for taking the time to look at our portfolio! We are looking forward to creating a Happy memory for you! The only thing that we would need many times is just chairs and tables. Lighting is good if the event is out doors, because we can not do our job right with out the right lighting. No sound or anything else is needed. Just enough space to work and be seen by the guest. No stage set up needed.